October earned ₹ 0.18 Cr on its 21st Day, Now Total Collection ₹ 45.05 Cr! October earned ₹ 0.27 Cr on its 20th Day, Now Total Collection ₹ 44.87 Cr! October earned ₹ 0.45 Cr on its 19th Day, Now Total Collection ₹ 44.6 Cr! 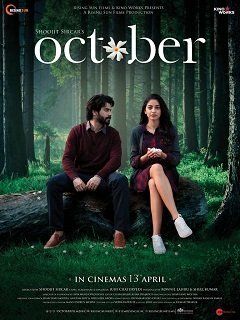 October earned ₹ 0.36 Cr on its 18th Day, Now Total Collection ₹ 44.15 Cr! October earned ₹ 3.42 Cr on its 9th Day, Now Total Collection ₹ 35.55 Cr! October earned ₹ 1.89 Cr on its 8th Day, Now Total Collection ₹ 32.13 Cr! October earned ₹ 2.25 Cr on its 7th Day, Now Total Collection ₹ 30.24 Cr! October earned ₹ 2.43 Cr on its 6th Day, Now Total Collection ₹ 27.99 Cr! October earned ₹ 2.61 Cr on its 5th Day, Now Total Collection ₹ 25.56 Cr! October earned ₹ 2.70 Cr on its 4th Day, Now Total Collection ₹ 22.95 Cr! October earned ₹ 7.74 Cr on its 3rd Day, Now Total Collection ₹ 20.25 Cr! October earned ₹ 7.47 Cr on its 2nd Day, Now Total Collection ₹ 12.51 Cr! October earned ₹ 5.04 Cr on its 1st Day, Now Total Collection ₹ 5.04 Cr! Varun Dhawan Tweets " Work is on full swing to get you October"